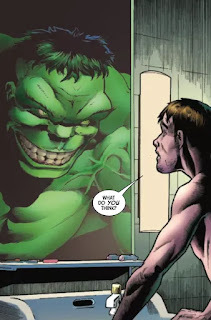 I've read comics from Marvel featuring the Hulk off-and-on for years, with some writers doing a stellar job writing about the not-so-jolly green giant and his alter ego of Bruce Banner, and some writers really struggling to find a good tone to go with. 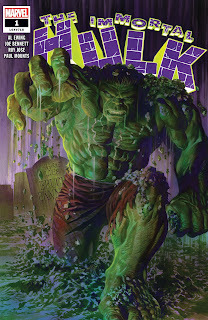 Al Ewing is a stellar writer however, so when I heard the latest re-launch titled, "The Immortal Hulk," would have more a horror-theme I was intrigued. 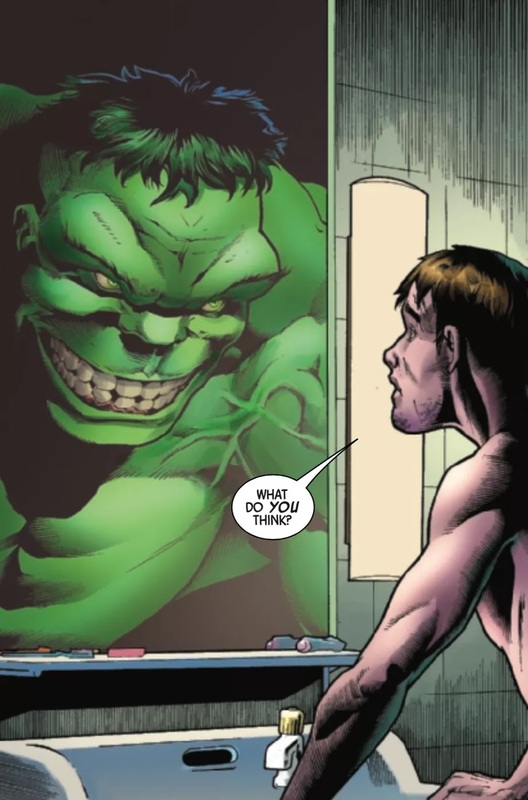 The concept of the Hulk itself is quite scary after all, it is Banner's Id unleashed, full raw rage and violence that he can only hope is pointed in the right direction at the, "Wrong," people. Ewing has been driving this point home opening each issue with an assortment of quotes from psychological and philosophical texts. It's been good stuff. 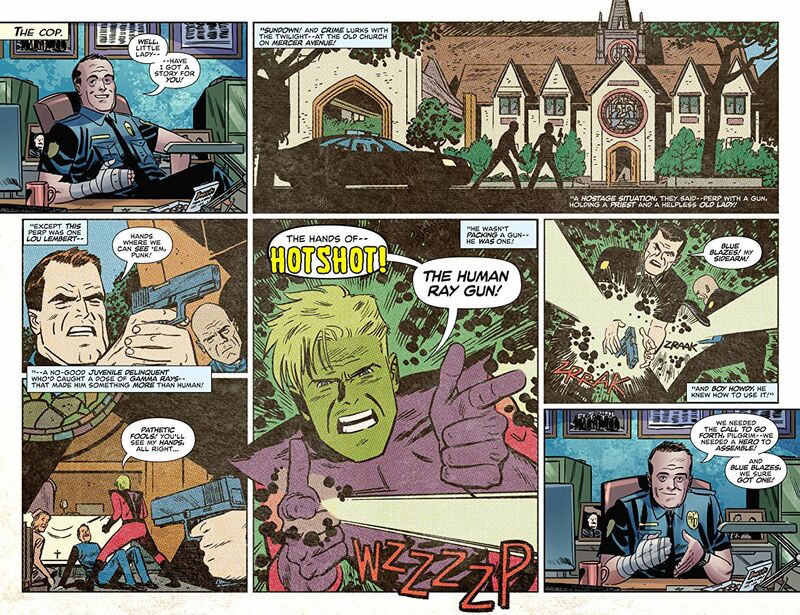 Oh, and the Hulk is moderately intelligent again, so he's even more dangerous. 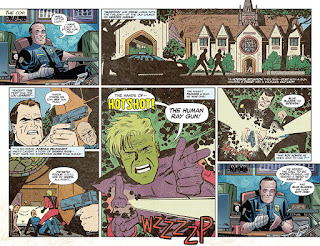 The first two issues were from Bruce Banner and his alter-ego's point-of-view, covering how he is officially, "Dead," in the eyes of the world but now using this freedom to roam about the U.S. solving various mysteries that relate to the Gamma Radiation that gave him his powers and righting wrongs he encounters along the way. 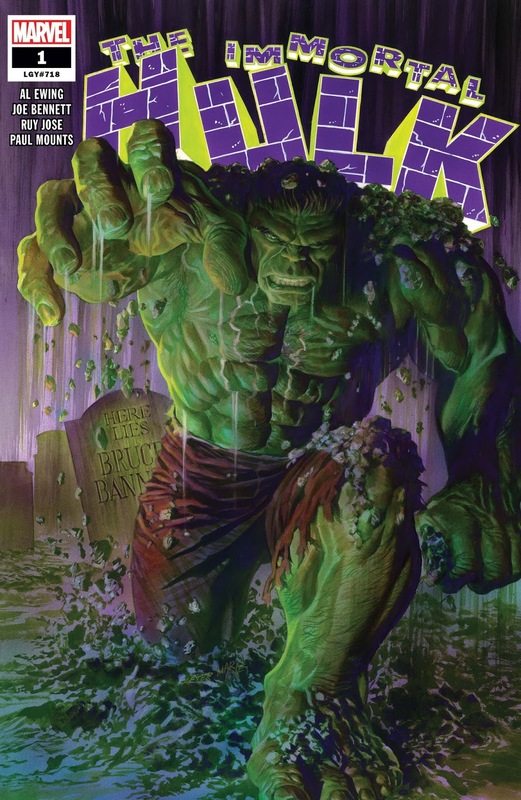 This in issue #1 has him attacking a biker gang and in the 2nd issue solving a grotesque case of anyone who mourns at a graveyard then getting sick and dying--a cycle of sadness and death quite fitting for a character like the Hulk. Banner and a both metaphorical and literal dark reflection of himself. The third and latest issue is quite interesting however in that it relays a number of people's perceptions of what occurred when the Hulk stopped a young man with gamma-based superpowers who was holding hostages at a church. It has a framing device of a reporter who has appeared in other issues (and who suspects Bruce Banner is alive) trying to get the bottom of what is going on, and interviewing an assortment of folk. They each tell the same story, but quite differently. There is a policeman who relays the story as if it were a Golden Age yarn of heroics, a bartender who only saw a disheveled Banner, an older woman who recalls things with a rosy and romantic viewpoint, and a priest whose version of events paints a horror-story vibe. Each, "Take," on what happened has a different art-style that works perfectly with how separately everyone's recounting is. This makes a relatively straightforward tale of The Hulk bursting in to solve a problem a lot more complex and interesting. I'd say it is a high-point of the three issues so far. "The Immortal Hulk," has so far been a fantastic comic thanks to the writing talent of Al Ewing and an assortment of great artists. The more horror-focused tone works perfectly for the character of the Hulk, and Ewing's clever story-telling techniques in the 3rd issue keep things rolling along delightfully. I'd say this series so far handily earns 5 out of 5 stars.